Springs 411: Downtown Jaywalking: Now, you can get hit from both directions! Downtown Jaywalking: Now, you can get hit from both directions! 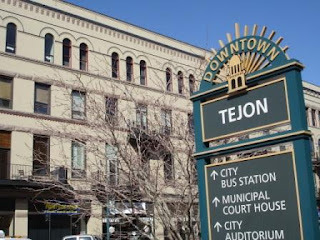 As of early Monday morning (April 7, 2008), the "main drag" through downtown Colorado Springs (Tejon Street) has reopened to two-way traffic. This isn't a totally new venture since it was like this 37 years ago when the city decided that it was too timeconsuming to drive through downtown. So, they chopped up parts and pieces of the street into one-way sections and it was like a small rat race trying to make your way around. The nice thing was, jaywalking was simple! You just look one way across the three lanes and run. Now, it's a bit more complicated and feels more like "Frogger" minus the logs. I was driving downtown this morning on Tejon and noticed a couple of pedestrians making feeble attempts to cross the now very busy street. Afterall, that was the point of the change and officials expect traffic to increase from 7,500 cars per day to nearly 11,000.